View More In Sesame Seed - Page 4. 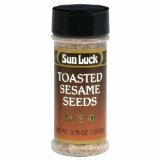 Use Sun Luck Toasted Sesame Seeds with Sun Luck Hot Mustard as a dip for your egg rolls, fried won ton, spring rolls and BBQ meats. If you have any questions about this product by Sun Luck, contact us by completing and submitting the form below. If you are looking for a specif part number, please include it with your message.